May 14 -- Guildford Coal Limited (Guildford or the Company) (ASX: GUF) is pleased to announce that, through its Mongolian subsidiary Terra Energy LLC, the Company has secured offtake agreements with two (2) separate end-users in China: Jiuquan Iron & Steel (Group) Co Ltd (JISCO) and Jiuquan Haohai Coal Chemical Co Ltd (Haohai), to sell coking coal produced at its Mongolian Baruun Noyon Uul (BNU) mine. Guildford, via its marketing agent Noble Resources International Pte Ltd, has agreed with JISCO to sell 15,000 tonnes of clean coking coal in May 2015 delivered DDP (Delivered Duty Free) JISCO plant at approximately a 30% premium to the Platts Hard Coking Coal 64 Mid Vol CFR (Costed and Freight) China index price which recognises the high quality and excellent value in use of the BNU brand of coking coal. Further, JISCO has agreed to purchase 35,000 ±5,000 tonnes of clean coking coal per month, for a term of 12 months, commencing June 2015. JISCO is located in China's Jiayuguan City and was established in 1958. JISCO is the largest steel company in western China and produces a large series of carbon steel and stainless steel products. In 2014, its total iron and steel production totalled approximately 10 million tonnes. Haohai has agreed to purchase 45,000 - 50,000 tonnes of clean coking coal from May to July of 2015 at a similar pricing to the JISCO deal. Further, Haohai has agreed to purchase 25,000 ±5,000 tonnes of clean coking coal per month, from August 2015 until April 2016. Based on the successful trial-use of 3,700 tonnes in the first quarter of 2015, Haohai has stated that Guildford's coal is with good consistency of clean coal quality: low sulfur, low ash and high caking index, and hence satisfies Haohai with its technical performance. Haohai was founded in 2012 to develop 2 1Mtpa coking plants in Yumen City, Gansu Province. Haohai's parent company has extensive experience in production and sales of coke and its byproduct chemical in Shanxi province – the largest coke production base in China. The first 1Mtpa plant went into production in 1Q of 2015, producing coke, benzene and tar. At present, its major product - Class II Coke (China Standard) has been sold to the steel plants in Gansu, Qinghai and Xinjiang Province. Haohai is looking to upgrade their Class II Coke to Class I Coke by using the premium hard coking coal product from Guildford's BNU mine. "Securing the offtakes with great partners such as JISCO and Haohai is a critical step towards our goal of becoming one of the largest and highest quality coking coal producers in Mongolia", said Michael Avery, Managing Director. May 15 -- The appointment today of Mining Engineer Mr David Stone, as Executive Director with Guildford Coal Limited ("Guildford Coal" or the "Company") (ASX: GUF), has added invaluable mining experience to the Company's board and management team, as it ramps up production at its South Gobi mine and evaluates potential expansion opportunities. Mr Stone will work alongside Managing Director, Michael Avery, as an invaluable additional executive resource for the Company. Guildford Coal's Interim Chairman, the Honorable Craig Wallace, stated: "Mr Stone has been a highly successful leader in the mining businesses for global corporations for over 20 years. He has progressed through the mining industry performing most roles including operations, technical and management." Since 2014, Mr Stone has been Chief Operating Officer of Wollongong Coal Limited, which operates a number of underground metallurgical operations. He developed and is implementing a comprehensive whole of business strategy for the company, prior to recently launching a US$630m refinancing process. As Chief Operating Officer of Cline Mining Corporation (2012-13), David Stone reviewed the company's New Elk asset (Raton Basin). After the business review, he was responsible for seeking board approval and implementing a business recovery plan, coupled with a detailed operational revision. Earlier in his career, Mr Stone has held various senior roles at Xstrata Coal over an 8-year period. These included a stint as General Manager of the successful Oaky Creek coal complex and Operations Manager at the Newlands project in Central Queensland. In 2010, David was promoted to be Xstrata's General Manager Undergrounds, for its global coal operations in 3 continents. "David's expertise is unparalleled in operating resources businesses, either in Senior Management, Project Development, Operations or Closure," Mr Wallace said. David Stone graduated with a Bachelor of Mining Engineering from the University of Wollongong, a diploma in Risk Management from the University of Queensland and a diploma from the Australian Institute of Company Directors. He has also served on a number of key government and industry committees and boards, including the Safety and Health Advisory Council of Queensland, Chairman of Queensland Resources Council Operators Committee, and Xstrata's nominated representative on the Act Review Committee of Queensland. 2nd Class Mine Managers Certificate of Competency. David is expected to join Guildford's management team in the new executive role within 5 weeks. 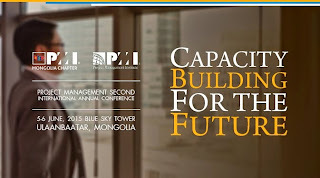 VANCOUVER, BRITISH COLUMBIA--(Marketwired - May 14, 2015) - Prophecy Development Corp. ("Prophecy" or the "Company") (TSX:PCY)(OTCQX:PRPCF)(FRANKFURT:1P2) announces that through its wholly-owned subsidiary, Red Hill Mongolia LLC, it has entered into a purchase agreement with an arm's-length party in Mongolia to sell substantially all of its mining and transportation equipment at the Company's Ulaan Ovoo mine for total proceeds of approximately $2.4 million subject to various currency exchange rates (the "Proceeds"). The Company received a cash payment of approximately $1,700,000. The remaining balance of approximately $700,000 will be paid to the Company in stages as equipment is picked up from Ulaan Ovoo. The process is expected to be completed by June 1, 2015. Prophecy is currently selling and will continue to sell its remaining Ulaan Ovoo coal inventory by contracting with a third party transportation company to haul coal stockpiles from the Ulaan Ovoo mine to railway siding at Sukhbaatar. Current coal inventory stands at 80,000 tonnes, of which approximately 20,000 tonnes have GCV of over 5,000 kcal/kg. Open-pit mining operations at Ulaan Ovoo may be restarted in short order by signing with any one of several available third party contract-mining companies in Mongolia that provide a turnkey solution with labor and equipment. The Company believes contract mining is a more efficient way to operate in Mongolia since contract mining firms will be responsible for labor agreements and equipment maintenance. The Company received consent from its creditor, Linx Partners Ltd. ("Linx") which held a general security agreement over the Company's assets, for the sale of the equipment which belonged to the Company's wholly-owned subsidiary, Red Hill Mongolia LLC. In consideration for allowing the sale of the equipment, Linx will receive 12 million share purchase warrants of the Company exercisable at $0.05 per share for a period of 5 years from the date of issuance subject to final approval from the Toronto Stock Exchange. The Proceeds will be used to repay the Company's existing loan from the Trade and Development Bank of Mongolia and to advance the Company's Chandgana Mine Mouth Power Plant and Pulacayo Silver-Zinc-Lead Projects. May 14 (Invest Correctly) Dalton Investments took the opportunity in 1Q2015 to carry out a number of reforms in its portfoliomix. The fund started fresh positions in four stocks, sold out of 15 stocks, added interest in three stocks and reduced holding in 12 stocks. At the end of the day, the fund's equity portfolio declined to $323.8 million from more than $398 million in 4Q2014. In terms of industries, Dalton Investments has its largest interest in Finance, which accounts for 52% of total portfolio. The fund also has substantial exposure to Healthcare and Materials. Here is a brief look at Dalton Investments' portfolio mix with a focus on its prominent holdings by dollar value as disclosed in the latest filing. Dalton Investments decreased its holding in Berkshire Hathaway Inc. (NYSE:BRK.B) to 400,766 shares worth $57.8 million at the end of 1Q. The fund's previous holding in the company was 495,600 shares, which were valued at $74.4 million at the end of 4Q. Dalton moved to narrow its exposure to Micron Technology, Inc. (NASDAQ:MU), cutting its holding in the chipmaker to 1.8 million shares from 1.5 million shares. The new stake was valued at $48.3 million at the end of 1Q. The previous holding was worth $52.8 million according to the previous report. Turquoise Hill Resources Ltd (NYSE:TRQ) was maintained as the third-largest single equity position overall in the portfolio of Dalton to the end of 1Q. However, the fund decided to shed some shares in the company during 1Q, reducing its holding to 11.3 million shares worth $35.2 million. The fund's previous interest in the company was 13 million shares valued at $40.4 million. Dalton lost love for American Express Company (NYSE:AXP), Johnson & Johnson (NYSE:JNJ) andLoews Corporation (NYSE:L) among other 12 stocks and deleted them from its portfolio. However, on a positive note, the fund initiated a fresh position 157,000 shares in ICICI Bank Ltd (ADR) (NYSE:IBN) in 1Q. The stake was worth $1.6 million at the end of the quarter. Ulaanbaatar, May 14 (MONTSAME) At the Stock Exchange trades on Thursday, a total of 1,089 units of 15 JSCs were traded costing MNT four million 481 thousand and 418.00. "APU" /250 units/, "Gobi" /232 units/, "Mongol shevro" /228 units/, "Khovsgol usan zam" /93 units/ and "Makh impex" /53 units/ were the most actively traded in terms of trading volume, in terms of trading value were "Gobi" (MNT one million 751 thousand and 600), "APU" (MNT 865 thousand and 200), "Talkh chikher" (MNT 720 thousand), "Mongol shevro" (MNT 501 thousand and 600), "Makh impex" (MNT 160 thousand and 100). The total market capitalization was set at MNT one trillion 264 billion 937 million 403 thousand and 990. The Index of Top-20 JSCs was 12,797.82, decreasing 0.69% and the all index of MSE was 939.48. May 14 (Bank of Mongolia) On the Foreign Exchange Auction held on May 14th, 2015 the BOM has not received any bid offers and selling bid offers of USD and CNY from local commercial banks. On May 14th, 2015, The BOM has received USD Swap agreement bid offer in equivalent to USD 35.0 and MNT Swap agreement bid offer of USD 24.0 million from local commercial banks and accepted the offers. As of Apr 2015 the total cumulative trade turnover decreased by 16.0% (USD 472.1 millions) from that of the previous year and reached USD 2,486.5 millions. The decrease in the trade turnover was due to the decrease in imports by USD 491.9 millions. The structure of the trade flows with the neighboring trade partners is as following: (i) trade with PRC: 62.2% or USD 1,546.5 millions and (ii) trade with Russia: 12.7% or USD 317.0 millions. The trade volume between Mongolia and China increased by 4.1% and the trade volume between Mongolia while Russia decreased by 3.2%. As of Apr 2015, the cumulative trade balance improved by USD 511.8 millions from that of the previous year and reached USD 418.0 millions. During the reporting period the total exports increased by 1.4% from that of the previous year, imports decreased by 32.2% from that of the previous year, thus the trade balance improved by USD 511.8 millions. As of Apr 2015, the trade balance of paid trade flows reached USD 454.3 millions. During the reporting period, paid imports decreased by 32.5%, and paid exports increased by 0.13% from that of previous year. As of Apr 2015, terms of trade index (2012 base year) decreased by 8.0% from that of the previous year and reached 1.675. This decrease in the terms of trade is mainly attributed to the de-crease in export price of copper concentrate and crude oil. The share of mineral exports in total exports decreased by 1.0 points from that of the previous year and reached 88%. Exports of coal, copper concentrate, iron ore and concentrate and crude oil have a weight of nearly 73% of total exports and 83% of mining exports. In addition, these 4 products' share in the mining exports de-creased by 5.6 points from that of the previous year, share in the total exports decreased by 5.9 points. Mongolian export increased by 1.4% from that of the previous year, which was mainly affected by increase in other exports. Main contributors were re-export of machineries and cathode copper, its components. Exports of copper concentrate increased by 26%, which accounted for 11% in growth of mining export. On the other hand, coking coal, iron ore and crude oil export decreased by nearly 29%, 35% and 40% respectively, which accounted for 16% decrease in the growth of mining export. As of Apr 2015, Mongolian export increased by 19.8 million USD from that of the previous year. It is affected by the increase of export commodities' quantities (USD 216.1 millions) and decrease in export commodities' prices (USD 196.3 millions) . Because of the increase in quantity of crude oil, nonmonetary gold and copper concentrate export, mining export increased by 255 millions USD. On the other hand, because of decrease in prices of mineral exports, mining export declined by 207 million USD. Cashmere, cashmere products' export decreased by 31 million USD, while other exports increased by 48 million USD. As of Apr 30 2015, gold price reached 1,184.4 USD, decreased by 8.3% from that of the previous year and increased by 0.1% from that of the last month. As of Apr 30 2015, copper and iron ore prices reached 6,364.5 USD and 59.0 USD. Copper price increased by 4.9% from that of previous month and decreased by 4.4% from that of previous year. 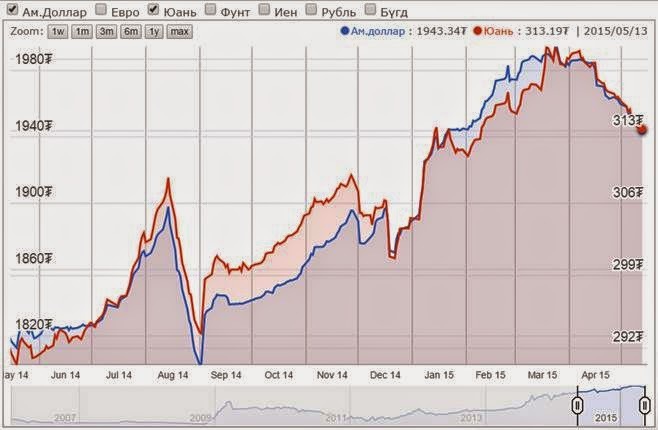 Iron ore price increased by 11.3% from that of previous month and decreased by 44.0% from that of previous year. As of Apr 2015, 32% of total imports were consumer goods, 33% were capital goods and 20% were fuels. Share of the capital goods in total imports increased by 4% from that of the previous year, while the share of other major imports decreased by 3-4%. Mongolian imports decreased by 32.2% from that of the previous year. Main contributors of this decrease were capital goods de-crease, which equals to 14% of the total decrease, and consumer goods imports which equals to 7% of the total decrease. Capital goods and consumer goods imports decreased by 38% (213 millions USD) and 23% (100 millions USD) respectively. Thus total import decreased from that of the previous year. Main contributors of decrease in consumer goods import were both in durables and non-durables. Passenger cars import de-creased by 36% (43 millions USD) and foods import decreased by 16% (25 millions USD). Capital goods import decreased by 38% (213 millions USD) which was mainly contributed by 37% decrease in machinery, equipment and supplies (114 million USD). In addition, import of construction materials decreased by 39% (72 million USD) from that of previous year. Intermediate goods and industrial materials import decreased by 12% (22 millions USD). Fuels import decreased by 42% (150 millions USD). The border price of oil has been decreasing since the end of 2013 (Figure 8). In parallel with global oil market price, it declined sharply in last 5 months, reaching the lowest level since 2010 in February. Even though, the import growth of non-durable consumer goods was relatively stable, it started to decline by bigger phase in last 2 months. May 14 (gogo.mn) Since last year NSO started to estimate the minimum living standard. At the national average, minimum living standard is at MNT 174,200 and it is the highest in Ulaanbaatar at MNT 185.400. 65.7 percent more in National Average. ULAANBAATAR, May 14, 2015 (World Bank) – Managing Director and World Bank Group Chief Financial Officer Bertrand Badré makes his first visit to Mongolia on May 15-16 to meet with the country's leaders and visit projects that support Mongolia's efforts to improve the lives of citizens. "I look forward to visiting Mongolia to better understand the country's development challenges and to discuss with the government and private sector how the World Bank Group can continue bringing its knowledge and financing to support Mongolia's economic and social development," said Badré. He will meet with Speaker of the Parliament Z. Enkhbold, Minister of Finance J. Erdenebat, Prime Minister Ch. Saikhanbileg, as well as representatives of the local private sector to discuss how the World Bank Group can continue helping development in Mongolia. Badré also will visit projects supported by the World Bank Group that focus on rural development, education, and energy, including the Sustainable Livelihood Project (SLP), Rural Education and Development (READ) Project, Renewable Energy for Rural Access Project (REAP), and a wind farm in Salkhit supported by the International Finance Corporation (IFC). Badré is responsible for the financial and risk management strategies of the World Bank Group and for the institutions that make up the Group. This includes development of new, innovative financial products and services, oversight of financial reporting, and mobilization of financial resources in alignment with the Group's strategy. He contributes to the international dialogue on financial standards and best practices, primarily through his representation of the Group at the Financial Stability Board. May 14 (gogo.mn) MP S.Ganbaatar made an announcement today May 14th, 2015. 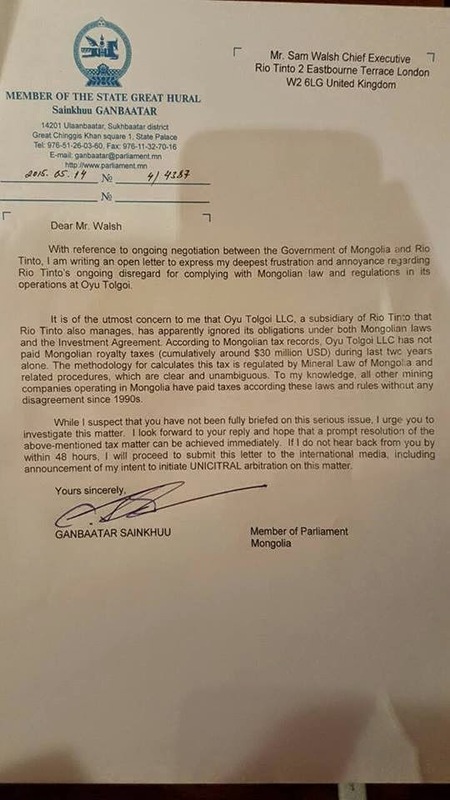 In the letter he expressed his deepest frustration and annoyance regarding Rio Tinto's ongoing disregard for complying with Mongolian law and regulations in its operations at Oyu Tolgoi. 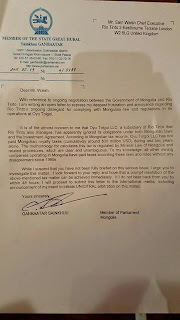 Moreover, MP has expressed his concern that Rio Tinto has apparently ignored its obligations under both Mongolian laws and the Investment Agreement as according to the Mongolian tax records Oyu Tolgoi LLC has not paid Mongolian royalty taxes cumulatively around USD 30 million during last two years and cited the methodology for calculating the tax by Mineral Law of Mongolia and related procedures and mentioned that all other mining companies operating in Mongolia have paid taxes accordingly with the law and regulations since 1990s. Further MP urged the CEO of Rio Tinto to investigate on this matter and reply within 48 hours. May 14 (gogo.mn) Plenary session is scheduled for today. 6. Amendments to the Draft Law on Administrative Court and amendments to the draft laws on the legal status of judges. 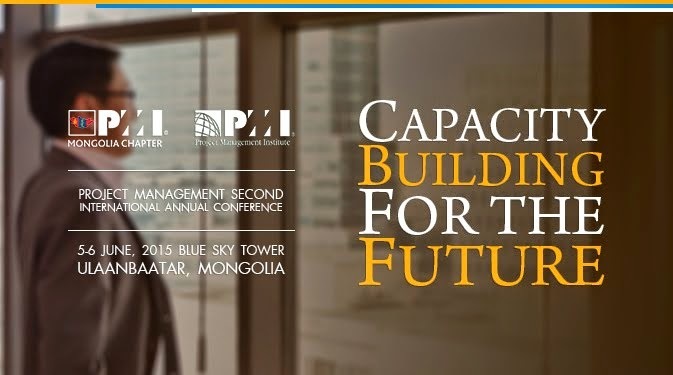 Ulaanbaatar, May 14 (MONTSAME) A draft of the Long-Term Development Policy of Mongolia has been developed by a parliamentary working group formed in accordance with a direction issued April 15 of 2014 by the Chairman of the State Great Khural. The document outlines main directions of the country's development from 2015 to 2040. The key document's draft was presented on May 13 by the above group, Office of the President, National Development Institute at the Academy of Sciences, Ministry of Finance, and UN Development Program Office. It sets out a goal to make Mongolia by 2040 a country that has highly intellectual and professional working cadres, happy and creative citizens, powerful diversified economy that comprises intellectual and cultural resources and technological and innovative capacities, fair contribution of wealth, efficient use of resources, a region with healthy and safe living environment, and a country that plays an important role in the global development. The director of the National Development Institute B.Enkhbaigali said the fundamental goal of this long-term policy lies in creating in Mongolia "all the best practices enjoyed by the humanity". The policy document lays down five key directions: to improve citizens, prepare highly-professional cadres and promote creativity; to improve capacity and policy management quality of the state bodies; to diversify the economy, penetrate actively to the global market, utilize the resources in the most efficient ways; to drill the latest hi tech and innovations to all fields and to adapt to the global climate changes; and to promote the middle-class, the main driving force of development, and to enhance the living environment where people enjoy their rights to live healthy and safe. Ulaanbaatar, May 14 (MONTSAME) M.Enkhbold and S.Byambatsogt submitted Wednesday to the Speaker a draft resolution on Organizing a Public Poll. The law on parliamentary election, adopted in 2011, indicates that 76 sits are elected as 48 by majority and 48 by proportional systems, "this must be changed, as all political parties consider although they adhere to contradicting to each principles", said M.Enkhbold and stressed that the sustainable and long-term election system needs to be established on a basis of the public poll results. "The people's decision is always the best," he noted. The draft resolution has been prepared on the basis of 11.1 and 12.2 clauses of the law on Public Poll. If adopted, many effective outcomes are expected such as the sustainable election system, an improvement of nation's trust in political parties and state authorities, an establishment of a new political culture in which pressing issues are solved through public polls, a reduction in politicizing and extreme preferences over one party's interests, and more time to settle country's vital matters rather than to deal with electoral disputes, Enkhbold MP explained. Ulaanbaatar, May 14 (MONTSAME) At the morning session of the State Great Khural of May 14, draft amendment to this law was adopted, backed by 65.2 percent votes. The introduction of the draft amendment was made by D.Sumiyabazar MP, a member of the Standing committee on social policy, education, culture and sciences. He said their committee had refined the draft for its final reading by reflecting different suggestions. There were no questions from the MPs regarding the final reading, so a voting took place on adopting the draft amendment as a whole. As a result, 65.2 percent of the MPs approved an adopting of the draft amendment to the Law on labor safety and hygiene. Ulaanbaatar, May 14 (MONTSAME) A deputy head of the General Authority of Specialized Inspection (GASI) Yu.Galsan Wednesday met Dr Soe Nyunt-U, the Permanent Representative of the World Health Organization (WHO) to Mongolia. Galsan thanked the WHO for cooperating with Mongolia in health, frontier, quarantine hygiene control, in providing professional and methodological advice, and rendering financial assistance. He proposed collaborating in co-organizing a third National Consultation of Hygiene and Epidemiology and a demo training on measures in case of livestock infectious diseases, in involving state inspectors in regional workshops, in fortifying capabilities of border checkpoints at the "Chingis Khaan" international airport and "Altanbulag" and "Zamyn-Uud" borders. He asked the WHO to give technical assistance to and to cooperate in working out methods of making risk analysis over foods and other products at border checkpoints. In response, Dr Soe Nyunt-U underlined a possibility of implementing these suggestions and appreciated the way the GASI attaches significance to its external ties and cooperation. May 14 (news.mn) During yesterday's Cabinet meeting, the new version of the draft law regarding medicines and medical equipment was discussed and approved. Minister of Health and Sport G. Shilegdamba was assigned with revising the final version of the draft law and submitting it for approval by Parliament. Although the law on medicines and medical equipment approved in 2010 has played a vital role in the foundation of a legal environment for the medical sector, due to the rapid increase of medicines being procured and changes to policy structure, the draft law's supporters believe that it has become necessary to review the standards of quality, security, and the utilization of medicines. According to a 2013 study, 19 percent of medicines on the market have not been registered in Mongolia and 14.6 percent do not meet industry standards. Only one percent of the nation's pharmaceutical producers meet requirements for proper medicine manufacturing standards. During the last four years, the import of medicines has tripled, and hospitals are buying medicines at prices that are 2.4 times higher than international standards. With the introduction of new treatments and technology, new medicines and medical instruments have been introduced to the healthcare industry. Hospitals and clinics supply 80 percent of medicine to the public, but hospital administrators say that current economic conditions and the weaker tugrug are having an impact on hospital budget expenditures. Inefficient procurement systems are also negatively influencing medical treatment and diagnoses. According to the new draft law, a new system will be created to provide accurate information and data regarding medicine and medical equipment, as well as a legal environment to establish the maximum prices for essential medicines and standard prices for essential diagnostic equipment and instruments. Ulaanbaatar, May 14 (MONTSAME) This willingness was sounded by the Minister of Health and Sport G.Shiilegdamba and the president of Mongolia's Academy of Sciences B.Enkhtuvshin on Wednesday. To ensure it, they inked a memorandum on three-year cooperation, intending to work together in sciences, in upgrading quality and effectiveness of researches of scholars, in studying urgent problems facing the medical sciences and technologies, also in work out necessary policies and decisions, and in providing them with knowledge-based scientific proof. Present at the signing ceremony were also B.Boldbaatar, a Vice Minister of Health and Sport; G.Ganchimeg, the State Secretary of the Ministry; Ts.Lhagvasuren, a president of the Medical Academy of Mongolia, and others. Ulaanbaatar, May 14 (MONTSAME) A member of the Constitutional Court and a full member of the Academy of Sciences Prof. J.Amarsanaa was elected to the office of the Chairman of the Constitutional Court on May 13. By the law on Constitutional Court, a candidate for the chairman's position is selected from the members of the Court and is chosen by a secret voting within the Court members. The chairman's office term is three years, with a possibility to be re-elected one time. A majority voted for J.Amarsanaa at Wednesday's general meeting of the Constitutional Court. The new chairman also bears a scientific doctor's and a doctoral degrees in juridical sciences. May 14 (Mongolia Focus) The following explanations are commonly offered to explain these faulty mining policies. External Factors – In the absence of major international or regional armed conflicts and threats (conventional and non-conventional), politicians often highlight two external factors – the dynamics of the global market and the geopolitical interests of major powers. Understandably, these external factors constrain Mongolian policy-makers – who have limited capacity to deal with them. Dynamics of Global Market. In 1990s, Mongolia was, like its two neighbours, desperate for western investors, but few responded because of the unattractive market environment (especially, infrastructure), uncertain political and socio-economic development, and underdeveloped regulatory framework for foreign investors. From a broader perspective, China was not seen as a promising market for natural resources. There also were the economic sanctions following the Tiananmen Square incident. Being overwhelmingly aid-dependent and isolated from the global and regional markets, Mongolian politicians had very little choice except to create the most welcoming regulatory framework for Western investors. They were unable to constrain investments from Chinese small and medium enterprises that were mostly in joint nature. When the potential benefits from the mining activities increased from 2000, Mongolian politicians were overwhelmed with increased interests from foreign investors; resulting in high expectation for resource-based development among politicians. Because of this politicians began to lose their earlier visions of non-mining development strategies (e.g., agriculture, tourism) and the economy became highly dependent on the international commodity prices as well as Chinese buyers. Instead of calculating the commodity market dynamics, politicians are now cover their mining policy failures under the commodity boom and bust cycles. Therefore, the dynamics of the global market is not alone responsible for the mining policy failures. It does offer both a blessing and curse for mining policy making because the reliance on the mining sector and a few mega projects – along with inefficient distributive policies –increases the vulnerability of Mongolia's economy. The Geopolitical Interests of Major Powers. Geopolitical interests also appeared to provide another reasonable external justification for politicians to evade public scrutiny for faulty mining policies. Since Mongolia is a small, weak, and peripheral state, all external actors – two powerful neighbours, distant major powers, their MNCs and SOEs, and IFIs – exercise strong, effective leverage over Mongolia. For the time being these external actors, except Russia on some issues, seem to be tolerant and respective for Mongolia's domestic policymaking process. In retrospect, Russia has been quite assertive in certain areas and has explicitly pressured Mongolian politicians to change their policies (Wachman, 2010; Radchenko, 2013). The first is the railroad. For Mongolia, the railroad is the most critical infrastructure for mining. With its partial ownership of the Mongolian railroad, the Russian government is heavily involved in the railroad politics. This is seen by its (1) rejecting the Mongolian government's attempt to accept the US Millennium Challenge Account funds ($188 million) for the railroad project; (2) advocating the linkage of major mining sites to the trans-Mongolian and trans-Siberian lines; and (3) delaying the linkage of major mining sites in southern Mongolia to the Chinese railroads. Uranium mining is another area. From 2009, Russia re-established its influence in developing uranium deposits in Mongolia by (1) establishing the joint liability company, Dornod Uran; (2) marginalizing the Canada-based Khan Resources Inc; and (3) agreeing to resume full-scale of cooperation with Mongolia in areas of uranium (e.g., education, training, and infrastructure). The last are on and off attempts of Russian state-affiliated oligarchs to be involved in major mining activities (e.g., Tavan Tolgoi and Asgat) and infrastructure projects (e.g., a power plant, railroad). The first two, the railroad development and uranium mining, were explicitly advocated by the Russian state whereas the other issues have been advocated by Russian oligarchs. In contrast, China has been more tolerant and less assertive in dealing with Mongolia – although it possesses strong leverage over Mongolian policymakers. First, China did not openly retaliate against Mongolia's inclinations to provide more opportunities for Western companies. This might be understood in the context of Chinese closer economic collaboration with the West. Second, China tolerated Mongolia's protective measures against Chinese SOEs' investment into mining, telecommunication, and banking sectors. For instance, Mongolian politicians cancelled the bidding of the Chalco, a state-own aluminum company, to buy the SouthGobi Sands coal mine and approved the Strategic Entities Foreign Investment Law. Third, Chinese companies appear to be accepting the mining policies, despite the unpredictable and unstable nature of these policies, and offering more flexible policies towards Mongolia, especially in the areas of joint development of infrastructure and access into Chinese transit networks and ports. This type of Chinese constructive behavior would certainly create a favorable market and investment environment for mining in Mongolia. Given these contrasting behaviors of Mongolia's two neighbours Mongolia has attempted to attract political security and economic interests of the so-called 'third neighbors' – distant major and secondary powers, that are expected to support Mongolia's efforts to maintain its sovereign statehood in a complicated neighborhood. Mongolia has restructured its macroeconomy with assistance from these states and IFIs, entered into a series of agreements with them to increase trade and investment, and even offered various types of exemptions, ranging from visa to taxation, for these states. With the commodity boom, long-term stability of the Chinese market and Mongolian desires for engaging non-Chinese firms, private companies of third neighbor states appear to have some advantages over Chinese and Russian SOEs. Moreover, the democratic system also provides these multinationals with formal mechanisms to influence domestic policy-making process. As a result, we have witnessed these multinationals exert influence through various channels. This includes advocating government policies (e.g., the United States), IFIs – especially, the WB, IMF, EBRD, influential politicians (e.g., James Baker, Tony Blair), and local partners. Although all these external actors – all simply pursuing their pure business interests (maximize the gain, minimize the cost) – contribute to competitive political and business environment for Mongolian politicians, none of these actors, except Russia in some areas, have demonstrated explicit manipulation of Mongolian policymakers in developing and implementing the mining policy. Therefore, it is not sufficient to point out external factors – the dynamics of global market and geopolitical interests of major powers – as key explanations for the mining policy failures of Mongolia. Domestic Factors – Politicians also point to two specific domestic factors for causing the policy failures. One is private business interests, which are expressed by political and business factions and business interest groups. The other is civil society activists, which have been labeled by politicians as "populists" a problematic term in Mongolia. Private Business Interests. Like any other democracies, including the developed ones, businesses have all possible channels to influence the policy-making process in Mongolia. In order to advance their business interests (i.e., to increase and protect their wealth), businesses always complicate the policy-making process – unless politicians, parties, and bureaucracies create and maintain the predictable and just business environment. This is the most complicated, especially during the transition period and also in a developing state like Mongolia. Starting from the gold rush period (1992) and privatization of state properties, natural resources contributed to the emergence of a new capitalist class. Many mining companies and individuals obtained mining licenses and privatized the state-owned mining enterprises, some jointly with foreign investors. This process was pushed forward by the coal-mining boom and increased foreign mining interests in Mongolia. All businesses wanted to capitalize on these ad-hoc opportunities. Some of them established the mining consortium to operate in the largest coal mine deposit (i.e., Tavan Tolgoi), some entered into a competition to disadvantage each other (e.g., MSC vs. Jenco), others quietly bargained over major mining projects (e.g., MAK) and still others competed for the supply side businesses (e.g., equipment, fuel, food, services and so forth). Today these competitions have became more intensified and are formally and informally institutionalized in Mongolia's political processes. Just a quick glimpse of the composition of the parliament, cabinet, and political parties demonstrates how much these private business interests are entrenched into the policy-making process. Therefore, this is clearly one of the influential factors for the policy failures, although all other democracies face this influence of business interests. Civil Society Activists and Movements. Politicians also blame civil society activists and environmental movements for mining policy failures. Like private business interests, politicians, parties, and bureaucracies cannot escape from the pressure of civil society movements. Until the main causes of the public discontent are sufficiently addressed and/or assured with reasonable medium and long term solutions, civil society activists and movements will not decline. In any democracy, the government would expect the public discontent and social mobilization when the government cannot provide important public goods, especially justice. This also applies to the Mongolian case. Since 1990 the civil society space has remained open for civil society activists, organizations, and movements. A few main themes – corruption, injustice, and environmental degradation – have been advocated by these actors. The growth of the mining industry simply intensified the public discontent for three main reasons. First, corruption, revolving around the natural resources, provides much stronger justification for the public discontent than the corruption involving foreign aid. The public is more concerned with the mining issues. This is because (1) the land and natural resources are considered the public, national property; (2) mining activities have the most visual impacts on the environment, society, economy, and politics; (3), especially in the Mongolian case, the public is concerned about non-transparent governmental debts (e.g., borrowing loans and bonds in anticipation of operating large scale mines with foreign investors). Second, the environmental damage, especially from artisanal mining, arouses a stronger sympathy from the public in comparison to other major social issues (World Bank, 2006; Swiss Agency for Development and Cooperation, 2011). Third, major mining investment projects provide an effective leverage for the public to pressure politicians, parties, and bureaucracies since political instability increases the risk for large-mining investment deals. Unlike authoritarian regimes, we would expect similar types of public discontent in other democracies, especially in developed ones, if the mining industry contributes to corruption, injustice, and environmental degradation. Any politicians, parties, and activists would pursue the populist politics for multiple purposes (e.g., morale, political, and rent-seeking). Therefore, like private business interests, civil society activism (plus populist politics) also is considered one of the influential factors for mining policy failures, although it is not the cause. Mongolia is overly dependent on fuel imports from Russia and transit routes to Europe while Russia maintains a significant percentage (49-51) ownership of Mongolia's key infrastructure (i.e., railroad), industry (i.e., Erdenet copper plant), and other joint ventures – such as Mongolrostsvetment LLC (the 4th largest fluorspar mining; potential silver mine). Mongolia is also dependent on Chinese investment, market, and infrastructure (esp., railways and seaports). However, these Chinese behaviors have been regarded suspiciously in Mongolia. May 14 (Mongolian Economy) In 2014, Mongolian insurance market had written MNT 107 billion in premiums including life market, an increase although marginally on yoy basis. Before the economic downturn of 2014, the market had enjoyed average 42 percent per annum premium growth for 4 consecutive years. Total assets of the sector have reached MNT 152 billion. G.Enkhtaivan noted that although the development of the sector has long way to go, on the brighter side of it, we have a real growth opportunity. G.Enkhtaivan who read BA in Business Management at Cardiff Metropolitan University manages outward reinsurance practice at Mandal Insurance LLC. He had previously worked in companies such as Tenger Insurance, Chono Corporation and UMC Alpha. As for his foreign work experience, he had worked at the "Maygrove Estates" real estate company in London. - The development of the insurance sector of the financial industry is relatively weak. Why is this the case? - Mongolia is a benign country where large accidents and natural disasters rarely occur. Compared to countries where there are significant risks of hurricanes, tsunamis or civil unrest, Mongolia is relatively safe; hence, there is not that much of an interest in insurance here. It is believed that a demand for insurance is positively correlated with the risk of loss. The development of insurance sector, or lack thereof, can also be explained by people's income level. People don't consider insurance as vital as food, clothing and shelter. Insurance is placed below in people's list of priorities. Furthermore, the regulation of the sector although commendable is however not quite befitting. There are drawbacks in our current business methods and ethics, on top of the fact that we don't have leaders in the industry as there is a lack of unity. The professionalism of the people leading the sector is certainly not at the level it should be. Expertise is lacking. Insurance is one representation of the knowledge economy, and the public lacks understanding about insurance. We should strive to taper this gap in understanding, by developing companies' public relations departments and giving the image of the industry a make-over. - How is our country's insurance sector faring compared to other that of other nations? - Generally speaking in developed countries, the insurance sector accounts for about 5-8 percent of the entire economy, whereas this figure stands at 0.6 percent in Mongolia. The underdevelopment of our insurance sector is obvious. If we look at our financial sector, the assets of banking sector account for the 97 percent of total assets and we are heavily imbalanced. Our company studied Mongolia's insurance penetration rate and compared it to Lloyds' international insurance penetration standards. According to the Lloyds study, the benchmark requirement for insurance penetration of emerging countries should be at least 1.6 percent of GDP. In other words, it means that the figure being at 1.6 percent is just acceptable, not satisfactory. If it's higher than that, fantastic. As of 2014, our insurance sector's revenues amounted to MNT 107 billion, and GDP growth is at 7.8 percent, or MNT 21.8 trillion. Our insurance penetration rate being at 0.6 percent means it is 62.5 percent lower than international standards. Hence, our insurance sectors needs to generate MNT 350 billion in revenues from premiums, or 2.7 times higher than the current level, to catch up to the satisfactory penetration levels. There are many businesses and people who are not insured. According to one study, only 12 percent of total vehicles in Mongolia are insured. Of those, even fewer are insured voluntarily, which hopefully will suggest how low insurance penetration truly is. Again, acceptable does not mean satisfactory. If we were to assume that we had performed as same as the Netherlands and had written premium equal to 9.5 percent of our GDP, this would have amounted to MNT 2.1 trillion. - What needs to be done to develop the insurance sector? - One of number of ways in which we can organise and develop the industry is that the insurance sector needs investment. Local insurers' capitalisation is distinctly low. Compared to other economies insurance is capital intensive and tend to generate desirable margin from relatively larger volume of business. If this were the case, we would see more benefits and operations would run smoother and faster. Although it is not entirely impossible, it is lot more difficult to achieve good results and experience excellent growth if we are writing against minimal capitalisation. There are non-organic methods which are more likely to be effective in today's globalised business environment with various possibilities to seek investors. All in all, capitalisation is the key to developing the insurance sector. - What type of insurance or insurance have the least market penetration? - If we look at the insurance types, vehicle insurance and property insurance are predominant. Large corporate risks such as commercial and industrial properties account for the majority of this figure. Small and medium-sized enterprises are less likely to buy insurance. Commercial health insurance market is one of the untapped areas, despite the fact that health is one of the major social problems in Mongolia. Such is the state of the market, so development is lagging significantly. Mongolia's rates of illness are high, even among our youth. People open donation funds and ask for help instead of getting insured. As the number of ill increases, so does the number of insured. The health sector has been neglected for many years. Now it's only developing because of the need in society. Today, two percent of every worker's salary goes towards health insurance, but it's hard for people to see the benefits because it's too complicated. - Is it possible to develop the insurance sector in conjunction with major projects? - Naturally, there are several possibilities to develop the sector. However, is it possible to develop our insurance companies within the context of large scale projects? Perhaps. First of all, projects need to be clear and defined. I see two types of projects: projects funded by foreign investments in mining and mine deposits, and the second type is projects such as infrastructure and housing construction. In the latter, principals are mostly domestic companies or the government. If insurance laws and regulations were reformed and amended, opportunities to work with such projects would become possible. In addition, the proponents on the Mongolian side must take on insurance issues themselves and cooperate with domestic insurance companies. Major mining companies are usually foreign-invested, foreign companies and thus, work with their own insurance companies. Of course those companies would also be foreign. The risk is in Mongolia, but domestic insurers are incapable of competing with foreign insurers. - So what should be done to improve the competitiveness of domestic insurance companies? - It's possible to create advantages for domestic insurance companies in Mongolia through legislative means. If this doesn't happen, we cannot compete with internationally renowned companies no matter how much we devote to advertising or promotions. Companies operating internationally work with big brokers or common insurers to reduce insurance costs under the master agreement or to create sources of additional income by way of budgeting the cost of insurance. The more the better if premiums are retained in the country. As more foreign companies come to Mongolia and get insured, the insurance payments are in turn going overseas more so. There are countries that make this a policy matter by requiring foreign companies to be insured by domestic insurers before getting insured by foreign companies. In other words, insurers that are unregistered and unlicensed in Mongolia by the Regulatory Commission would not be able to operate as an insurer in Mongolia if our country had this regulation. Aside from these, the clients in Mongolia must take responsibility for the insurance issues of infrastructure and construction projects by itself. May 14 (news.mn) Today, Minister of Agriculture R.Burmaa received Vice Minister of Agriculture of Bulgaria Vassil Grudev to discuss cooperation in agriculture. At the beginning of the meeting, Minister R.Burmaa stressed, "The signing of an agreement for a technical assistance program in the agricultural sector will help the traditional friendly relationship flourish between our two countries, and will create a foundation for mutually beneficial co-operation between the two countries." She stressed that the Government of Mongolia has begun the work to build winter greenhouses with Chinggis Bond funding, and is interested in developing cooperation with Bulgaria. Bulgaria is comparable in quality to greenhouse technology produced by Holland, which is leading in greenhouse technology and management experience worldwide. The Minister presented a proposal to invite specialists from Bulgaria to Mongolia to give recommendations to greenhouse enterprises, to conduct technology and management training, to acclimatize high quality seeds, and to involve Mongolian agricultural specialists in short-term training and introduction travels. May 14 (infomongolia.com) On May 13, 2015, Minister of Environment, Green Development and Tourism, Mrs. D.Oyunkhorol received in her office a Turkish delegates led by the Ambassador Extraordinary and Plenipotentiary of the Republic of Turkey to Mongolia, Murat Karagoz, Project Coordinator for Turkish International Cooperation and Development Agency (TIKA,) Ekrem Kalan and Office Representative of Turkish Airlines, Erdinc Caki. At the beginning of meeting, Minister D.Oyunkhorol noted, "The two countries have been implementing a long term cooperation program since 1994 and as a result it has been significantly contributed to the Mongolia's tourism sector, for instance, an intergovernmental agreement of cooperation in environmental sector to develop environmental and eco-tourism in Mongolia was signed in 2006. Therefore, we hope an implementation of the agreement will be continuing and bring practical outcomes". Moreover, the Minister added that Mongolia has successfully participated the ITB Berlin 2015 as an Official Partner County and mentioned Turkey's participation as a Partner Country in 2010, which thereafter brought 28 million tourists and increased up to 38 million in 2014. In this sense, Minister D.Oyunkhorol expressed her interest to share experiences and conveyed her gratitude to Turkish Airlines for free travel of some Mongolian delegates to attend the ITB Berlin 2015, an annual largest tourism trade fair. In turn, Ambassador M.Karagoz noted that in the scope of attracting 38 million travelers, Turkey tops at the sixth place globally for the development of tourism sector and in the frameworks of bilateral collaboration he affirmed that there are big opportunities to broaden cooperation in tourism as well as to increase number of direct flights between the two capital cities. Concluding the meeting, Ambassador of Turkey pledged to support all initiations forwarded by the Ministry and handed an invitation to attend the EXPO 2016 Antalya, the World Botanical EXPO to be hosted for the first time in Turkey. May 14 (infomongolia.com) Mongolian National Chamber of Commerce and Industry (MNCCI) is hosting a Mongolia-Buryatia Business Meeting to promote bilateral cooperation between entrepreneurs at 02:00 pm on May 15, 2015. The Buryat delegates will be represented by Zheldorremmash OAO, Tyumen Medical Equipment Plant OAO, Selenginsky Concrete Products Plant OOO and other leading businesses to offer track usage, train depot, parts and maintenances, as well as to perform presentations in construction sector and exchange of offers to cooperate. Ulaanbaatar, May 14 (MONTSAME) A delegation headed by D.Battulga, the Head of the Citizen's Representative Khural of Ulaanbaatar city, is visiting China's capital city by invitation of Mr Du Deying, the Chairman of Beijing People's Congress Standing Committee. The latter welcomed his guests on Wednesday. He thanked Battulga for visiting Beijing and emphasized that the two capital cities ought to deepen their ties and cooperate in all spheres. "The cities entered into the sisterhood relations in 2014," he reminded and said the current visit launched the collaboration between the two Councils of the cities. In response, Mr Battulga thanked the Chairman of Beijing People's Standing Committee for giving opportunity to get au fait with the People's Congress of Beijing, and noted that the ties between Ulaanbaatar and Beijing forwarded at all stages and gained a progress in the strategic relations. The sides also concurred to expand the inter-city cooperation and to collaborate in construction, urban planning, investments, education and humanitarian spheres. Battulga invited his Chinese colleague to our city. May 14 (gogo.mn) May 18th to August 30th hot water outage will be done in Ulaanbaatar city due to the repair works scheduled on heating lines with investments from the State Budget. According to the annual schedule the heating in the apartments will be cut off on May 15th. Office and apartments near Otgontenger University, Kino Uildver, Bayanzurkh District, 14th secondary school, Bayanzurkh Eco Town. Office and apartments near Narkhan, Jargalan, Odod Town, Bayanmongol Town, Shine Dul, South of 13th microdistrict, Нархан, Жаргалан, Оддын хотхон, Баян Монгол хороолол, Шинэ дөл, 13-р хорооллын урд хэсэг, National Center for Contagious Disease, Jukov Museum, Narantuul Market,, Akhmad Town, Sunjin Grand Hotel, Altan Tevsh Town, Bayanzurkh district hospital, Kino Uildver, Ministry of Defense, 16th microdistrict. Office and apartment buildings near Construction College, Khonkhor 7, Worker's Union Cultural Palace, Golomt Town, West side of 5th microdistrict, Altai Town, 19th microdistrict, Avarga University. Office and apartment buildings near Autobus-1, Atar Urguu, Steel Factory, Urangan LLC, Narnii Town, City Transportation Authority, Shine Tugul. Office and apartment buildings near Kharaa Hotel, Bumbugur Center, Geser Temple, Tengis Movie Theatre, Bishrelt Hotel, TEDY, Urt Tsagaan, 6th microdistrict, Government Auto Base, Dulguun Nuur, Autoplaza, 7th microdistrict, 100n Ail, Children's 2nd hospital, ESM, Computer Management School, 12th microdistrict. Office and apartment buildings near2nd microdistrict, Railway Management Authority, Grand Plaza, 3 and 4 microdistrict, 6th microdistrict, Mother and Children Health Center, MNB TV station. Office and apartment buildings near Khar Khorin Market, Erin and Unur districts, Gurvaljin market, Golden Park, south of 10th microdistrict road. Office and apartment buildings near 3rd hospital, Nurse School, Trauma Center, Gobi Sauna, 25th drugstore, UB Palace, 10th microdistrict, Moscow Town, Electric Transport JCS. Office and apartment buildings near 5 Shar, Nomin Warehouse, Nefti Base, Altan Taria JCS, 21th microdistrict, Songinokhairkhan distrcit. Office and apartment buildings near IFE, Ministry of Agriculture, bayanzurkh Market, Water and Sewage Authority, Wrestlers Palace, 2nd hospital, Khan Palace Hotel, 72th secondary school. Office and apartment buildings near Culture and Recreation Park, Soyolj, Traffic Police, Continental Hotel, 21th secondary school, 13th and 15th microdistrict. Office and apartment buildings near New Sports Palace, Chinggis Khaan Airport, Nisekh area, Devshil Trade, 013th base, Autobus-2, Military Town, Wholesale, 10th bus stop. Office and apartment buildings near 5th microdistrict, Circus, 220K, Embassy of South Korea, Amarbayasgalant Hotel, Chinggis Hotel, Swimming Pool, Military University, Central Library, Blue Sky Hotel, Ministry of Foreign Affairs, 1st hospital, 1st Maternity Hospital, Central Cultural Palace, Tuushin Hotel, Pharmaceutical Factory, Saruul, Locomotive Depot, Shine Mongol school. May 14 (The Diplomat) Recent years have brought many prominent examples of political mobilization online, but most future growth in Internet users will come in countries with repressive and authoritarian regimes. Some democracies are attempting to mobilize soft power to reinforce real security concerns about less-than-friendly regimes around the world, and especially in Asia. Mongolian President Tsakhiagiin Elbegdorj opened the conference on May 4. The president presented a rosy image of the state of online freedom in Mongolia. He also clearly positioned the conference as yet another step in Mongolia's strategy to engage powerful democracies around the world. Ulaanbaatar, May 14 (MONTSAME) A goal to maintain a "one window" principle must not be forgotten or ignored in foreign relations or when all state bodies at all levels make ties with outer world through one voice and by one channel. It was underlined by the Minister of Foreign Affairs L.Purevsuren during the "Hour of Minister" weekly meeting Thursday. In frames of this work, a matter on ensuring a united regulation of external relations has been presented to all levels of parliament, government, the capital city and provinces, he added. He also said the Department of Foreign Economic Cooperation at his Ministry has been established with an aim to pass into a system of carrying out the external economic affairs only through the Ministry of Foreign Affairs. In frames of accelerating the external economic policy, a Minister of Foreign Affairs has been appointed the head of Mongolian sides of intergovernmental Commissions with Russia and China. Such an appointment is vital to enhance the commercial and economic ties with Russia and China, to unite activities of sub-commissions and working groups at the intergovernmental commissions, and to run the policies with the two countries through one window, the Minister said. A Department of foreign propaganda and media has been set up at the Foreign Ministry's structure with a key purpose of propagandizing Mongolia abroad, the Minister said. A national program on Mongolian propaganda has been worked out to promote culture, arts, heritage, history, custom, sport, sciences and society foreign relations by spreading information about them in foreign world, he said. Another national program--on registering pieces of Mongolian cultural heritage abroad--has been formulated together with the Ministry of Education, Culture and Science and the Academy of Sciences. Moreover, a preparation is being ensured to join the UNIDROIT Convention on Stolen or Illegally Exported Cultural Objects, Purevsuren said. Ending his "hour", the Minister pointed out that a complex policy is being drawn up to widen the policy which is more focused on Mongolians abroad and to support their proposals and initiatives. Ulaanbaatar, May 14 (MONTSAME) The Minister of Foreign Affairs of the Republic of the Union of Myanmar Mr U Wunna Maung Lwin will pay an official visit to Mongolia by invitation of his Mongolian colleague. The Myanmar's FM will be received by the President Ts.Elbegdorj and the Premier Ch.Saikhanbileg. The two Foreign Ministers will hold official talks to exchange views on a visit of Myanmar's President to Mongolia this year, to touch upon Mongolia's experience and challenges in transmitting to the democracy, and to highlight a bilateral cooperation at international arena. This will be the very first visit of Myanmar's Foreign Minister to Mongolia. Why on earth is Narendra Modi going to Mongolia? May 14 (Quartz India) Ulan Bator doesn't usually figure on the itinerary of most world leaders, but Indian prime minister Narendra Modi—after visiting China, and before flying into South Korea—will make a trip to the Mongolian capital on May 17. No Indian prime minister has ever visited the country before. So, why exactly is Modi going there? "The subtle message is for China," Kanwal Sibal, a former Indian foreign secretary, told Quartz. "China has been very active in India's periphery and India is also looking to play on their periphery. India and Mongolia have also had very friendly relations. But Modi will want to convey the message that India has an all-encompassing foreign policy." Since coming to power a year ago, Modi has spent much time and effort on foreign policy. He has visited 16 nations in 11 months, and hosted US president Barack Obama, Chinese president Xi Jinping and Russian president Vladimir Putin, among others. Closer to home, he has made trips to Bhutan, Nepal, Sri Lanka and Myanmar, and attempted at resuscitating India's image in South Asia. But the elephant in the room remains China—and going to Mongolia is part of New Delhi's strategy to deal with Beijing. "China is a big factor in Modi's foreign policy," Rajrishi Singhal, senior geoeconomics fellow at Mumbai-based think tank Gateway House, said. "India is looking to befriend all its neighbours in the region, but with Mongolia, it's more of a geostrategic and neo-economic play." Since the 1990s, resource-rich Mongolia, sandwiched between China and Russia, has been working to expand partnerships with countries beyond its two big neighbours, sometimes termed as its "third-neighbour policy." And Modi is trying to build on that. "It's never too late to build relationships," Rajorshi Roy, a researcher at New Delhi's Institute for Defence Studies and Analyses (IDSA), explained. "Geographically, Mongolia is at the crossroads of the Far East and North Asia, and China has always been a critically important neighbour." At the same time, "Mongolia has always been very friendly towards India," Roy added. "It supported India during the Bangladesh Liberation war in 1971 and is also a supporter for India's permanent seat at the United Nations Security Council." Still, India has a lot of ground to cover in Mongolia. After peaking at $60.2 million in 2012, bilateral trade between the two countries fell to $35 million in 2013. China, in comparison, did about $6.2 billion of trade with Mongolia in 2012, and wants to take it to $10 billion by 2020. Moreover, China currently accounts for 90% of Mongolian exports, while imports are dominated by China, Russia, South Korea and Japan. Despite that, significant opportunities for India remain. Mongolia, for instance, has massive reserves of uranium, coal, copper and gold. "If Modi wants to power up a 10,000 MW nuclear power project, he will need continuous supply of uranium. He can hedge that supply chain with Mongolia," said Singhal of Gateway House. India currently has massive power deficit and Modi's government has promised to change that through unconventional sources, including nuclear. Indian companies had also ventured into Mongolia to tap the huge reserves of coal and copper in the past few years, but on the ground, it hasn't translated into much. In 2012, Indian steel maker SAIL had entered into a joint venture with the Mongolian government to set up iron ore and coal mines in the country. Little has come of that partnership. May 13, 2015 (Institute for Defense Studies and Analyses) India-Mongolia relations have underpinnings in the age-old historical and cultural relationships spanning over 2500 years. In fact, between the 12th and 19th centuries, many Mongol rulers titled themselves as Chakravartin Khan. Today, the country, located in the remote northeast of Asia, remains the last frontier where Indic cultural imprints remain strong. The incarnate of the last Mongol theocratic Khalka Jebdtsundamba (historical lineage of Acharya Taranath) lived in India until he died recently. The demise of Communism and the revival of Buddhism have added a new dimension to Indo-Mongolian relations. India traditionally attached great strategic importance to Mongolia. Vice President Dr. S. Radhakrishnan visited Mongolia in 1957. Subsequently, India began to strongly advocate Mongolia's case for UN membership despite China's opposition. At the 10th UN General Assembly, India's Permanent Representative Krishna Menon said, "Mongolia was founded neither yesterday nor today, but has existed as an independent State over many centuries. Hence, similarly like any other country, the Mongolian People's Republic has full rights to become a member of United Nations Organization." A few years later, during the course of his address to the 15th UN General Assembly, Jawaharlal Nehru too argued in favour of Mongolia's UN membership thus: "If they received so many countries in the United Nations then why should Mongolia stay outside it? What had she done wrong? What kind of error did she commit with the Charter? The people of Mongolia are tranquil and her peace-loving toilers are firmly striving for progress, and it seems absolutely wrong, from the principle point of view, not to allow her to the great organization." All these may have irked the Chinese. India also supported Mongolia's membership in the Non-Aligned Movement. For its part, it was Mongolia along with Bhutan which co-sponsored the UN resolution for the recognition of Bangladesh's independence in 1972. This ruptured Mongolia's relations with Pakistan. Mongolia also gives unstinted support for India to be a permanent member of the UN Security Council. Today, India and Mongolia are both members of the Community of Democracies. Mongolia is the geographical pivot of history. Way back in the 12th century, during the days of Pax Mongolica, Chengis Khan's soldiers conquered Baghdad. Even today, Mongolia is a geographical titan (half of India's territorial size) although its population is only three million. In fact, another half of the country, Inner Mongolia, has been incorporated by China since 1911. Because Mongolia is geopolitically sandwiched between Russia and China, it could not escape Sino-Russian rivalry. Since the Cold War ended, Mongolia has shed its image of being under Soviet tutelage and is now seen as one of Asia's vibrant democracies. To seek an independent role in international affairs, Mongol strategic thinkers began to articulate the "third neighbour" policy to develop overseas partnerships with the United States, Japan and India. In the early 1990s, the Mongol colour revolution was inspired by Indian wisdom; it chose the Buddhist path for transforming Asia's first Communist state into a democratic society. The Indian Embassy at that time dwarfed the Russian, Chinese and American missions. Mongolia's strategic position at the cross junction of Central Asia, Northeast Asia, Far East, China and Russia attracts major powers towards it. For the United States, Mongolia is an important partner in its "pivot" to Asia. At the same time, Mongolia's geographic proximity to North Korea and Afghanistan were also factors in US calculations. Mongol troops were deployed in Iraq and Afghanistan. The US President visited Ulaanbaatar in 2005 to endorse the country's contributions to US war efforts. There is also the China angle. American academics think that the psychic burden of Chinese occupation weighs more heavily on the Mongols in Inner Mongolia than on Tibetans and Uighurs. A sovereign Mongol state next-door could still spawn nationalism with spiralling effect on China's unity. That may be a future project for the United States. As pointed out earlier, India traditionally did not ignore Mongolia despite the country being peripheral to its immediate interests. Many would see Prime Minister Modi's visit to Mongolia in the context of China. There is an element of truth in this given India's continued interest in ensuring Mongolia's political independence. But to view the partnership with Mongolia only from the China containment angle means a failure to consider Mongolia's own strategic interests. Looking at Indo-Mongolian relations only through this prism would be rather simplistic and misleading. For Mongolia, the relationship with China remains its top foreign policy priority since everything that came to Mongolia from the Soviet Union in the past is now being replaced by China. No other country can match China's economic incentives, trade and investments in Mongolia. 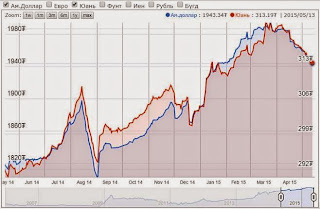 China has replaced Russia as Mongolia's most important economic partner. Trade with China has gone up from about USD 24 million in 1989 to over USD 300 million in 2000. India's trade is merely USD 25 million. It is also true that China's deep economic forays is opposed by the Mongolian public. There is wide spread and pronounced anti-Chinese feeling among Mongols. Mostly, this is over China's major resource development projects, i.e., extraction of minerals, coal and copper in Tavan Tolgoi and Oyu Tolgoi in the Gobi desert. This makes many observers fear that Mongolia's growing economic dependency could once again result in a loss of independence, this time around to China. Fortunately, after a brief pause, Russia is attempting to restore a semblance of its influence in Mongolia. Putin decided to write off 98 per cent of the over 11 billion roubles Soviet-era debt and has committed to modernize Mongolia's railroad and mineral industry. For India, the cultural bond with Mongolia is its biggest asset. The BJP has always emphasised upon this aspect. In 2004, Atal Bihari Vajpayee conferred D. Litt (Honouris Causa) to Mongolian Prime Minister Nambariin Enkhbayar for his role in promoting democracy and Buddhism. This was a critical diplomatic move by India to reach out to Northeast Asia. The foundation for the first ever Mongolian Buddhist Monastery in Bodh Gaya was laid then. That Prime Minister Narendra Modi is continuing this vision and approach is visible now. His visit to Ulaanbaatar to commemorate the 60th anniversary of the establishment of diplomatic relations and the silver jubilee of Mongolia's democracy is significant. The significance of his visit lies in the fact that he is the second Indian leader after Nehru to take the cultural ownership of Mongolia. Nehru fought for Mongolia's status at the United Nation. Today, Modi's India has greater economic strength to nurture the relationship with Mongolia. Modi will be the first Indian leader to address the Mongol Great Khural (parliament) on 17th May. Over the years India's relationship with Mongolia has been widening to include strategic elements such as the import of uranium from Mongolia. Defence cooperation has grown and the militaries of the two countries conduct Exercise "Nomadic Elephant" regularly. Consultation between the National Security Councils of the two countries since 2006 covers aspects such as cyber security. Cooperation between India's Border Security Force (BSF) and Mongolia's General Authority of Border Protection (GABP) helps build inter-operability as well as enhance GABP's capacity to manage its vast border with China. Surely, Modi will push for greater trade and investment ties with Mongolia. Mineral discoveries are the key to expanding Mongolia's appeal to exploration companies. In fact, Mongolia's natural resources such as uranium, coal and copper deposits are mouth watering. But for India to compete with other stakeholders plus transporting Mongolia's riches to India would remain hazardous and uneconomical. Nevertheless, India should explore the prospect of developing a gold mine in Mongolia's Oyu Tolgoi (Turquoise Hill). India should consider Mongolia as a green zone of economic development that absorbs hi-tech features and production skills in a modernization process. India should invest in agro-farming in the vast Mongolian steppes. At the diplomatic level, India and Mongolia have the potential to work together in regional and sub-regional groupings. Strategically, Indian and Mongolian interests in China and Central Asia coincide. Mongolia has been consulting India on issues relating to the Shanghai Cooperation Organization. In this context, India and Mongolia must cooperate to fight against terrorism and fundamentalism. Mongolia is located in close proximity to China's volatile regions. Surely, internal developments in China will also have implications for both Mongolia and India. Mongolia plays a key role in Asian energy transportation as it falls on the crossroads of major energy supply routes. India also needs to factor Mongolia in its Russia policy as well, for safeguarding interests in the Asia-Pacific region. India's benign presence in Mongolia is desirable for India's future interest in Russia's resource-rich trans-Siberia and Far East. To preserve and promote the common heritage of Indo-Mongolian culture is important. This should serve as the basis for nurturing and pursuing future common interests. May 15 (The Asian Age) A new era is expected to usher in stronger India-Mongolia ties when for the first time an Indian Prime Minister sets his foot in Ulaanbaatar on May 17. Mongolia is a country with which India shares centuries-old cultural and historical linkages. The relationship was renewed in the mid-20th century when the two countries reciprocated diplomatic relations in 1955. Since then there has been a steady but sluggish improvement in the strategic dimensions of our bilateral relationship including trade and economic cooperation among others. In the recent past, Mongolia caught the eyes of the international community when it joined the ranks of one of the world's fastest growing economies after registering an astounding growth rate of over 17 per cent, the highest in the world, in 2011 and an average 15 per cent in the following two years. The reason was its mining boom which is estimated to fetch billions of dollars when new copper, gold, coking and thermal coal mining projects, Oyu Tolgoi and Tavan Tolgoi, became fully operational. Besides these reserves, a vast unexplored potential of copper, gold, petroleum, coal and uranium makes the country an attractive investment destination for Indian mining companies. If successful, it will sustain a likely boost in demand of raw materials and energy and help the Make in India initiative back home. It is, therefore, essential to pave the way for Indian investment in the mining sector in Mongolia by reinforcing the Bilateral Investment Protection and Investment Treaty of 2001 between the two countries. Late last year, The Economist reported a dispute between the Rio Tinto, which is controlling the Oyu Tolgoi project, and the Mongolian government which has 34 per cent stake in this project, over the scale of management fees, the kinds of cost overruns and demands for tax. Realising the economic implications and a need of creating an investment friendly climate, the Mongolian government considered its demands on tax and could review whether in future it needs stakes or just royalties. The Indian government should persuade its Mongolian counterparts to emphasise on the latter to revive the foreign direct investment inflows to Mongolia which has fallen by three-fifth in 2014. It would thus avoid getting into a Rio Tinto kind of situation. On trade, India and Mongolia should aim for substantial increase in bilateral trade over the next five years from a mere $ 24.28 million in 2013-14. Following the Agreement on Trade and Economic Cooperation in 1994, though the two governments had reciprocated the most-favoured-nation status, their bilateral trade remained substantially low before it picked up in 2009-10 but started falling after two years. Therefore, the question is how to enhance and sustain our bilateral trade relations. The approach should be the up-gradation of existing agreement on trade and economic cooperation to a 'preferential market access framework' by mutually lowering tariffs on certain commodities on which there could be possibilities of entering into long-term commodity agreements. For example, Mongolia has the potential to fulfil resource needs of India whereas India's assistance, particularly in the application of information technology and IT-enabled services, can help diversify mining-oriented Mongolian economy. This will help achieve 'servicification of manufacturing' in the mining sector and its ancillary industries in both countries and will make them more competitive. Mongolia's keenness in enhancing its ties with countries under its 'third neighbour policy' (other than China and Russia) is what India should leverage while developing bilateral and multilateral mechanisms for exploring new avenues of cooperation in Asia and the Pacific. India and Mongolia can possibly carve out the roadmap of a cooperation framework where the 'governments' and 'civil society organisations' of 'third neighbour policy' countries seek to determine and assist Mongolia and other such countries in a comprehensive set of strategic areas including trade, investment and infrastructure development. Linking physical connectivity among Mongolia-Kazakhstan-Uzbekistan-Turkmenistan with the International North-South Corridor via Iran could be a pivot towards achieving this objective. It is in this light one needs to see the shape that the 'Nomadic Elephant'- an annual cooperation on joint military exercise between India and Mongolia - takes in future after this debut visit of an Indian Prime Minister and India's quest to deepen its trade and economic integration with a country of strategic importance. May 14 (infomongolia.com) On May 13, 2015, Chief of the President's Office, Mr. Puntsag TSAGAAN received the Ambassador Extraordinary and Plenipotentiary of the French Republic to Mongolia, Mr. Yves Delaunay and Vice President for Business Development at Air Liquide's Large Industries World Business Line (WBL), Mr. Dieter Grabenbauer. The Air Liquide's Large Industries WBL provides gases to customers in the refining, chemicals, energy and metallurgical industries, and the French multinational company with its subsidiary Lurgi GmbH have been conducting exploration in Mongolia for over 3 years. As a result, the company is working on a project to produce synthetic combustible gas from liquid and brown coal. During the meeting, the sides exchanged views on the project overview and on documents that are expected to be signed during the upcoming visit of the President of Mongolia to France on June 11-12, 2015. Also, the Ambassador Yves Delaunay noted that the Air Liquide is interested to invest in Mongolia's agriculture, high technology, industry and other sectors as well as notified that bilateral documents on these issues are ready to be signed by French side during the Presidential visit to France. May 14 (gogo.mn) State Great Khural Plenary session is discussing the agenda for today. The agenda for today includes whether to discuss the draf law on waiving the customs taxes submitted on April 10th, 2015. Introduction on the draft law was made by Minister of Finance J.Erdenebat and the conclusion of the Budget Standing Committee was introduced by MP M.Sonompil. The draft law on waiving from the customs taxes includes the issues of the technical loans from the Austrian Government worth USD 40 million. The loan is to have zero interest rate. Minister of Finance J.Erdenebat noted that the discussion of the soft loans from abroad by the two standing committees and two times discussion by the State Great Khural takes much time. There is standard in Mongolia to waive the customs taxes on the technical import purchased with the soft loans, whereas some of the MPs namely MP B.Choijilsuren were asking if there is any conflict of interest concerning this waiver to which Minister of Finance replied that this specific draft discusses only technical loans associated with Austria and no other countries are in discussion. While MP D.Terbishdagva noted that fire fighting equipment should be solved within this frameork, but on the other hand state needs taxes to frame the budget. According to Minister of Finance the equipment sent from Red Cross to its Mongolia branch was once waivered from the customs taxes and in 2014 equipment worth MNT 109 billion was waivered from the taxes procured by the state entities. Moreover, minister have note that private sector has privillege of postponing customs taxes on import equipment for up to 2 years. 47 MPs out of present 61 have voted for the approval and the draft law has been submitted for discussion preparations to Budget Standing Committee. In case the draft to be approved by the parliament the technical loan worth USD 40 million to be granted to import medical equipment and sewage equipment for repair works in the Ulaanbaatar city sewage system. Government sees the loans as the best way to deal with the issues in the time of economic downturn. Caritas Mongolia: "Combatting a culture of meat with vegetables "
The executive director of the Catholic Charity organization, Fr. Pierrot Kasemuana, speaks to AsiaNews about the projects and interventions in the Asian country: "Our most important mission today is in agriculture. We push people to understand the importance of a nutrition not only based on protein and saturated fat. " Although the Church is young and still small in number, it is fostering great relations with society: "They have the positions that must be understood. And we have to see them as our brothers and sisters in the human family. " Rome, May 14 (AsiaNews) - Cultivating potatoes, cucumbers, cabbage and carrots in a society of nomadic tradition and where the climate does not help agriculture. This is one of the most important missions of Caritas Mongolia: "Fighting the 'culture of meat", making the people understand the importance of healthy eating based not only on protein and saturated fat. It may seem a small thing, but in this way we help to reduce mortality from cardiovascular problems and to make the future greener ", says Fr. Pierrot Kasemuana, executive director of Caritas Mongolia, who is in Rome for the General Assembly of the Catholic organization, speaking to AsiaNews. The priest is originally from the Democratic Republic of Congo. A CICM missionary, he has been in Mongolia for 20 years: "I welcomed the first Italian missionaries [the Consolata- ed] when they arrived in East Asia. And now I consider them as younger brothers, or perhaps my children." Currently, says Fr. Kasemuana, "we have different programs. The most important and the most difficult is to promote a 'culture of vegetables'. Mongolia has a nomadic tradition, which includes a nutrition concept based on meat. Increasingly, over time, we have tried to teach people that only eating meat is not good for one's health. Because this creates a number of problems, from cardiovascular issues to gout. The mortality rate increases because people do not eat vegetables. " That is why, he adds, "we are trying to promote the agricultural sector as much as possible. It must be said that, given the climatic and soil conditions, Mongolia is not the best country in the world for farming the land. In fact, the soil is suitable for only two, maximum four months a year. With the greenhouses operated by Caritas, however, this period can cover nine months: we start in March and arrive to early November. " And so we can get good crops of carrots, potatoes, cucumbers and cabbage. This project also has socio-economic implications: "In addition to supporting a new food culture, we employ those who live in poverty in our greenhouses. For a specified period these people work and are paid a wage to cultivate the vegetables in our greenhouses. We also hand management over to them. This way they can sell what they cultivate in the markets, learning a trade and escaping poverty. " But there are also other programs, including those aimed at women: "We have started crafts centers, aimed at those who migrate from the countryside into cities. These people, mostly women, find themselves in unfamiliar environments and work while their husbands do not know what to do. Through courses in sewing and crafts we help them to find new ways of working and earning a living. " The Catholic Church in Mongolia, said Father. Kasemuana, "is a reality still small in terms of number and history. The same can be said of Caritas, even if through the great bridge of charity we can overcome the misunderstandings that sometimes arise with the government or Mongolian society, particularly regarding foreigners and Christians. The important thing to understand is that some of their positions are justified: we must listen to them without prejudice and without wanting to impose anything. We must always look at these people as our brothers and sisters in the great human family. " May 14 (gogo.mn) Judoka Ts.Munkhzaya wins her counterparts at the Asian Judo Championship in 63 kg female category and wins the Champion title. She defeated Nishikawa Maho from Japan, Bronze medalist of Tokyo Cup by wazari score. This is the second golden medal from the Asian regional competition and first from the Asian Championship for Ts.Munkhzaya. During the match Ts.Munkhzaya experienced an injury in her left shoulder just 17 seconds before the match ended. Team Mongolia ranks third in overall performance as of first day of the competition with one gold, two silver and two bronze medals. May 14 (infomongolia.com) The 2015 World Cup Series has legged in Fort Benning, the United States, where 600 athletes representing 76 nations arrived here and on the Day 1, the 2015 ISSF Rifle and Pistol World Cup / 25m Pistol Women semifinal continued with final was held on May 13, 2015. In the 25m Pistol Women, Mongolia's Otryad GUNDEGMAA clinched her second consecutive World Cup Gold medal in 2015 season. The 2008 Olympic Silver medalist O.Gundegmaa beat Bulgaria's Boneva in the Gold medal match re-affirming her Olympic berth for 2016 Rio, where the reigning world champion Zhang Jingjing (China) won the Bronze medal match and consequently, the Rio 2016 Olympic Quota places went to Bulgaria and France. Merit Athlete of Mongolia, Hero of Labor O.Gundegmaa, who had placed in second at the end in the semi-final with 17 hits, took the lead of the medal match after the second series, and shot her way to the highest step of the podium with a net score of 7 points to Boneva's 1. O.Gundegmaa, ranked second in the world in this event, had already secured a World Cup Gold and a Rio 2016 Quota place at the first World Cup stage of the season held in Changwon, Korea in April 2015. Therefore, the first of the two Olympic quota places went to Silver medalist Boneva Antoaneta (Bulgaria). The Bronze medal went to the reigning World Champion, Zhang Jingjing ( China), who beat the 2014 Junior World Champion Mathilde Lamolle (France), ranked 88th in the world and competing in her first world cup final round. Lamolle secured the second Rio 2016 Quota place assigned by the ISSF. Before the medal matches, the semi-final had cut out four shooters: the 2012 Olympic Silver medalist Olena Kostevych (Ukraine) and Hedi Diethelm Gerber (Switzerland), who placed in fifth and sixth with 15 hits each, while London 2012 Olympic Champion Kim Jangmi (South Korea) and two-time Olympic Bronze medalist Dorjsuren MUNKHBAYAR (Germany), who closed the match in seventh and eighth place with 12 hits each. May 14 (gogo.mn) In scope of the "Friendly Ulaanbaatar" program, City Governor`s Office, City`s Culture and Art Department will jointly organize major entertainment and cultural events with private entities which aim to promote the value of contemporary and traditional arts as well as to increase the number of tourists. Today, City Governor`s Office and City Culture and Art Department signed on cooperation memorandum. · "UB dance" Dance Festival are planned to be held in Ulaanbaatar within June. Head to Yuyintang this Friday evening to see three very diverse bands joined onstage to collaborate with Mongolian folk group Guren. Rock Naadam presents Mongolian (from the country, not Inner- Mongolia) folk collective Guren "invading" - or collaborating - with artists representing North America, Europe, and Asia. Guren, made up of Altan-Od (khomei/throat singing and percussion) and Khongor (morinkhuur/horse fiddle), has played in Shanghai a few times now to great success. Check their Youtube (or Tudou) video's below. They'll be joined by psych-rockers Duck Fight Goose, European jazz group Hot Club of Beijing and Americana hard folk group The Horde. DJ B.O will be dropping his favorite Mongolian folk, pop, and rock tunes before the show and in-between the bands. Ever wondered what a mix between Papasuda's tropical music, DJ Verse@ille's dance music sets and Mongolian folk music would sound like? 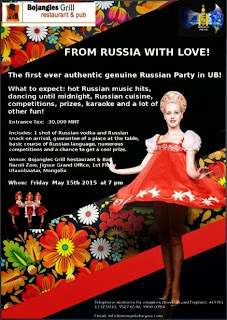 Go find out tomorrow night at the YYT's concert after-party at Kulou, where the Mongolian Invasion continues. Skinny Brown's tropical vibes meet DJ Verse@ille's ("In the Trap") dance music collab with Mongolian folk group Guren. Skinny Brown will be giving his Papasuda party a Rock Naadam twist to make Mongolsuda. He'll be joined by DJ Verse@ille (In The Trap, FUNKSION) who has a banging club set with Mongolian folk group Guren. There will also be a special international musical guest that will make a cameo for the night. Skinny Brown's mix of pan-tropical bass n' club music, which has been described at what a late night party sounds like in a 3rd world community center, has been rocking Shanghai for years. Tomorrow is a rare chance to see it happen outside of its regular spot in Dada. DJ Verse@ille is from South Africa and has a variety of successful party series to his name, including trap series "In The Trap," charity series Making a Difference (MAD), and the latest, FUNKSION, which mixes old school and new funk with live entertainment. He'll be performing with Mongolian folk group Guren. Expect hard beats with improvised and mystical Mongolian music. Guren is composed of Altan-Od (khomei/throat singing and percussion) and Khongor (morinkhuur/horse fiddle).